THE STORY - Young Kubo's (Art Parkinson) peaceful existence comes crashing down when he accidentally summons a vengeful spirit from the past. Now on the run, Kubo joins forces with Monkey (Charlize Theron) and Beetle (Matthew McConaughey) to unlock a secret legacy. Armed with a magical instrument, Kubo must battle the Moon King (Ralph Fiennes) and other gods and monsters to save his family and solve the mystery of his fallen father, the greatest samurai warrior the world has ever known. THE GOOD - Absolutely stunning animation with a very mature storyline. Dario Marianelli's score. THE BAD - So said storyline is unconventional and not always communicated well enough. "If you must blink, do it now" because you will not be able to take your eyes off of "Kubo And The Two Strings." It is an absolutely stunning achievement for Laika Studio who previously released "Coraline," "Paranorman" and "The Boxtrolls." "Kubo And The Two Strings" is their most accomplished work to date, with homages paid to Japanese filmmaker Akira Kurosawa and continuously celebrating the art of storytelling. It's a dazzling film which all ages can find enjoyment in despite its unconventional plot. Kubo (Art Parkinson) is a young boy living in ancient Japan with one eye who had his eye ripped out by his evil grandfather years ago when he was only a baby. His mother staged a daring escape to keep her son alive and has raised him since then in solitude. Every day Kubo travels to the local village where he stuns the villagers with his gift for storytelling, accompanied by a magical guitar he uses to transform paper into origami. His mother's evil sisters (Rooney Mara) eventually discover the young boy and Kubo is separated from his mother and is now accompanied by an overly protective monkey (Charlize Theron) and an insect/samurai hybrid known as Beetle (Matthew McConaughey). Together they will help Kubo gather together an ancient weapon to vanquish the Sisters and the Moon King (Ralph Fiennes) who has possessed his grandfather and is coming for Kubo next. "Kubo And The Two Strings" is packed to the brim with a tremendous amount of heart to back up its gorgeous visuals. The screenplay is one that celebrates family and the bond we share with our loved ones in life and in death. 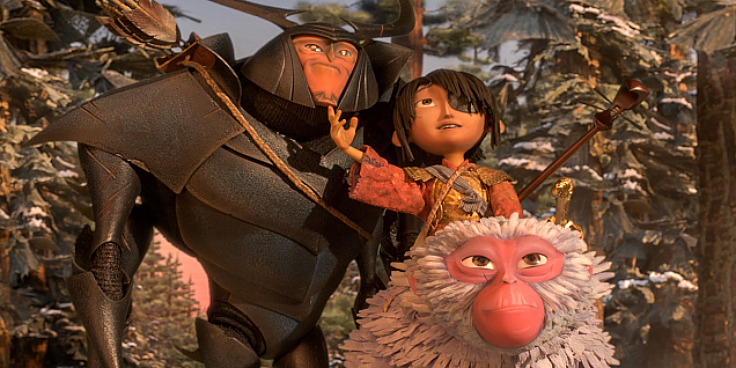 While children may not be able to grasp all of the thematic complexity which "Kubo And The Two Strings" presents, it's still broad enough to capture the imagination and wonder of moviegoers of all ages. There is talk of destiny and magic but it is all handled with supreme care by first time director and Laika Studios CEO Travis Knight. While other family-friendly films such as "Finding Dory" move at a faster pace and sprinkle more laughs throughout, "Kubo And The Two Strings" takes its time and handles its material with care while respecting the audience. It's bold storytelling from a brave animation studio that is continuing to advance themselves as a dominant force within the animated filmmaking industry. The voice acting is fine throughout the film. Matthew McConaughey is somewhat miscast as Beetle as he still manages to retain those McConaughey-isms which have managed to find their way into nearly every one of his performances. Art Parkinson from "Game Of Thrones" fame is believable as the film's hero Kubo but it is Charlize Theron as Monkey who gives the best performance. As Monkey she is stern, overly protective yet powerfully reserved. Despite encouraging Kubo to stay alive, she's not all that encouraging as a character. It's this character trait which makes her memorable. As stated before, the animation is so dazzling that you may forget that it is stop-motion animation. There are comparisons in the design of the film towards the "Kung Fu Panda" series but knowing how painstakingly difficult it is to pull of stop-motion animation, the filmmakers are all working on another level with "Kubo And The Two Strings." Kubo is a storyteller and that is where the heart of this film lies. One may wonder why the film is called "Kubo And The Two Strings" when he has three strings on his guitar. Be patient and let the filmmakers take you on a magical journey as all will be answered in time. This is one of the finest animated efforts of the year despite a few minor quibbles. Did I also happen to mention that the score by Dario Marianelli is absolutely beautiful and one of the best of the year? "Kubo And The Two Strings" is the full package, one which you won't regret checking out.